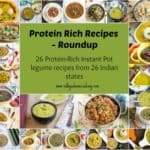 Last year I posted Ricotta cheese rasamalai, and I was overwhelmed with the response that I received. 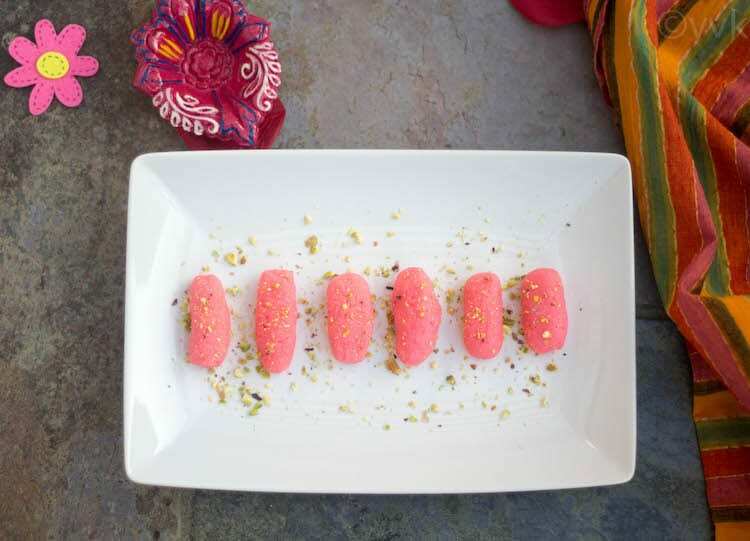 So this year too I decided to prepare some sweet with Ricotta cheese, and here it is – the Sondesh. The steps are super simple. 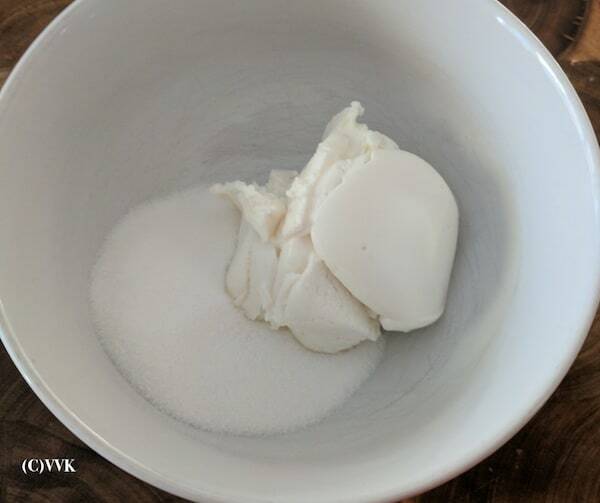 Mix the sugar and ricotta cheese and microwave them until it’s crumbly. Add your favorite flavor. Let it cool and shape it as desired. It’s as simple as that. I love the elongated oval shape, hence went with that shape. You can use a mold for other patterns or just shape it round. This measurement yields ten small pieces as shown in the picture. I prepared this last Saturday when our friends visited, and even before dinner, the dessert got over. 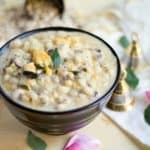 This Sondesh is a party pleaser so be sure to make a lot. 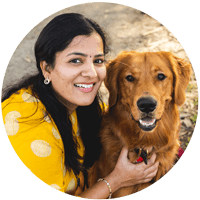 :-) I have explained about the ricotta cheese in my rasmalai post. 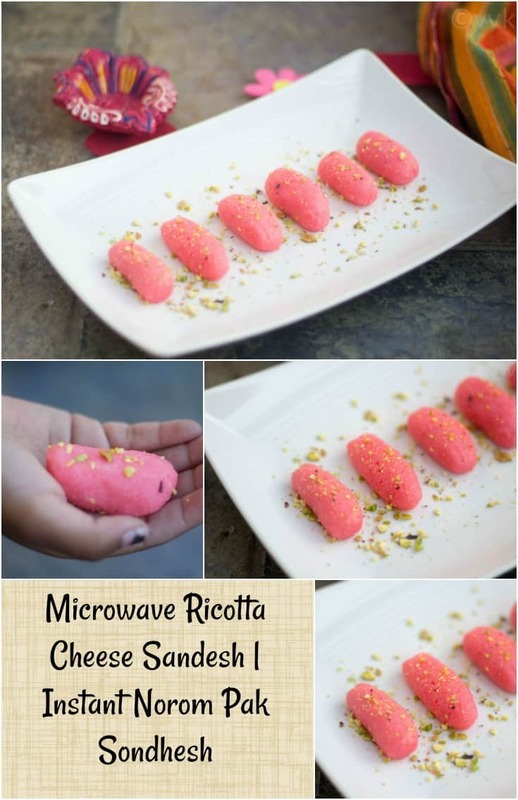 So without any further ado, let me share this Instant Sondesh with Ricotta Cheese. 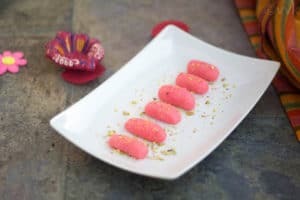 Diwali Special Sweet Recipe – A delicious Bengali Sweet Sondesh or Sandesh prepared with Ricotta cheese in the microwave with the delicate flavors of rose syrup. 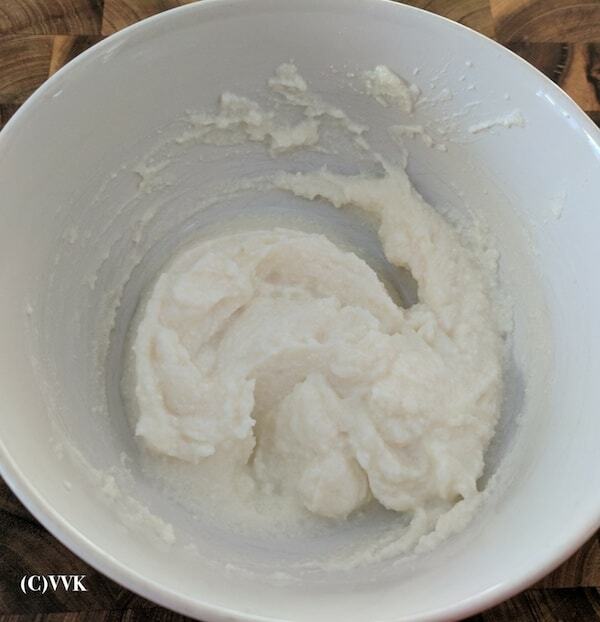 Take half cup of ricotta cheese and sugar in a microwave-safe bowl. Microwave it for one minute. The sugar will melt, and the mix will be of a pouring consistency. 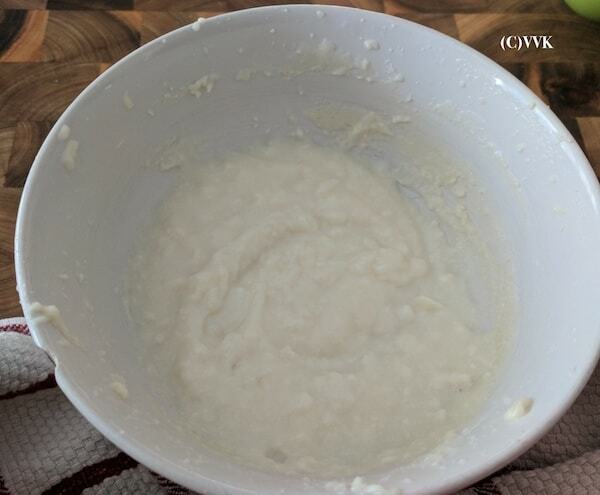 Then microwave again for one minute and remove it from the microwave and mix it well. 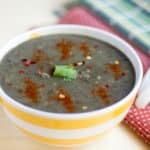 Now microwave it again for 1.5 minutes and remove it. 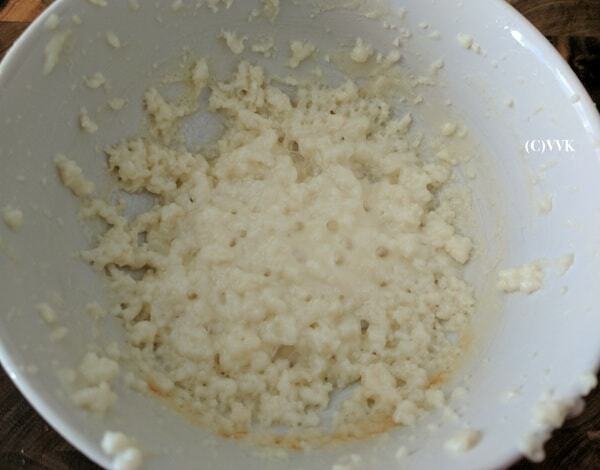 The cheese sugar mix will slowly thicken and will slightly grainy like below. Stir it back. Microwave this for one more minute. After this, the cheese will be grainier than the previous stage. 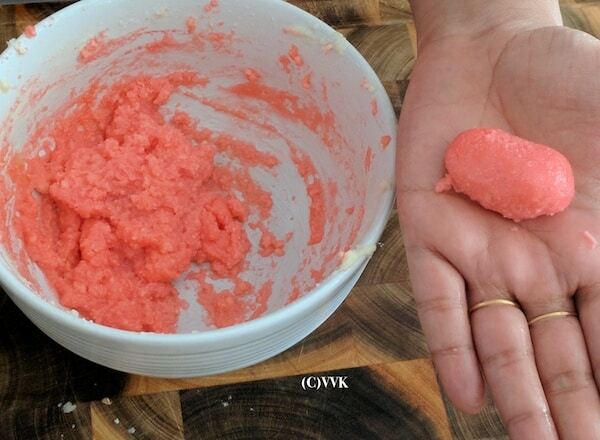 During microwaving, mainly after 3 minutes, the mix starts to pop out. That’s completely normal. Edges browning is also usual. Make sure you keep stirring the mix for every one minute and don’t let the cheese stick to the bottom. Now add two tsps of rose syrup and mix thoroughly. Microwaving after adding rose syrup is optional. I just cooked it for half more minute again. Let the mix cool for 2 to 3 minutes. 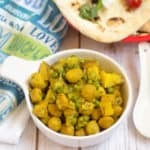 Now grease your palms with ghee generously and take a small quantity of the cheese mixture and roll it into a round ball or as per your preference. 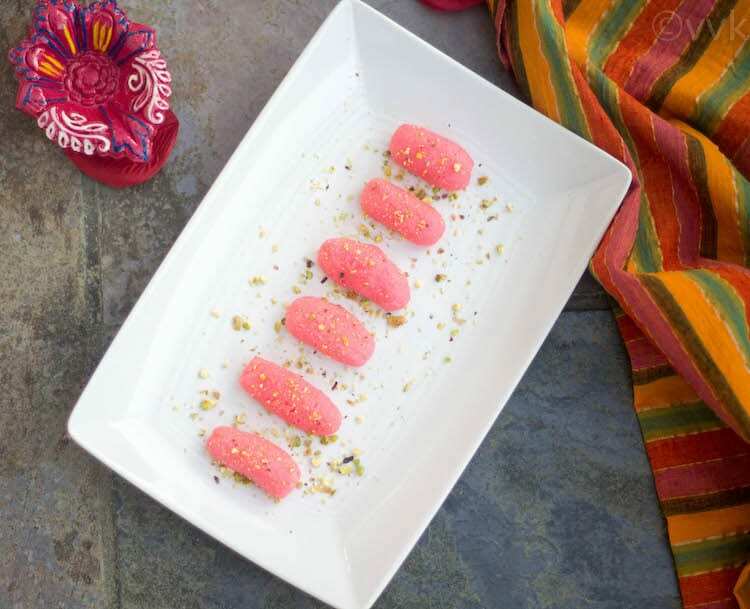 You can use the traditional Bengali molds also. As I mentioned, I went with an oval shape. You can either serve them fresh or refrigerate and serve chilled. Adjust sugar as per your preference. But keep in mind that ricotta cheese is mildly sweet. 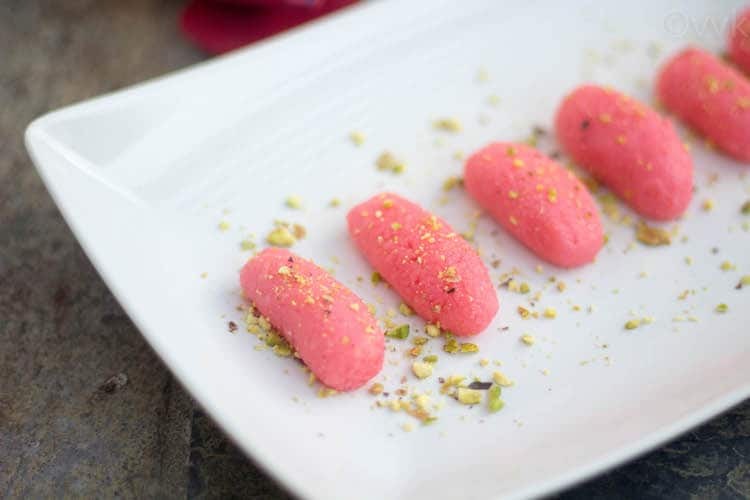 Instead of rose syrup, you can cardamom or saffron soaked milk for other flavors. 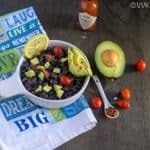 Depending upon the quantity and microwave setting, the cooking time might vary. Make sure you stir the mix for every one minute and cook until the cheese becomes granular. That’s the right stage. Wow, these look awesome! I’m definitely going to try making them myself. Thank you for sharing!! 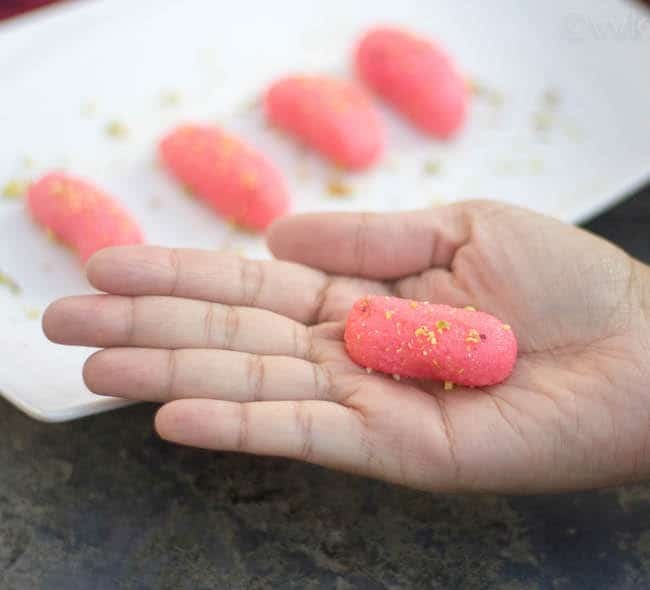 Your sandesh looks so cute and inviting Srividhya, making it in microwave is so easy.